Hoard of the Dragon Queen: reviewed! Here be dragons? Here be spoilers! First proper big adventure for 5e arrives (Lost Mines doesn’t truly count in this regard, I think) and it comes in an unusual guise. It was farmed out to Kobold Press, a highly regarded 3pp, and written by Wolfgang Bauer and Steven Winter, both ex of WotC themselves. It’s billed as levels 1-7, and only the first half of a campaign, Tyranny of Dragons, which deals with some baddies bringing the evil chief dragon Tiamat back from her prison in the Nine Hells. 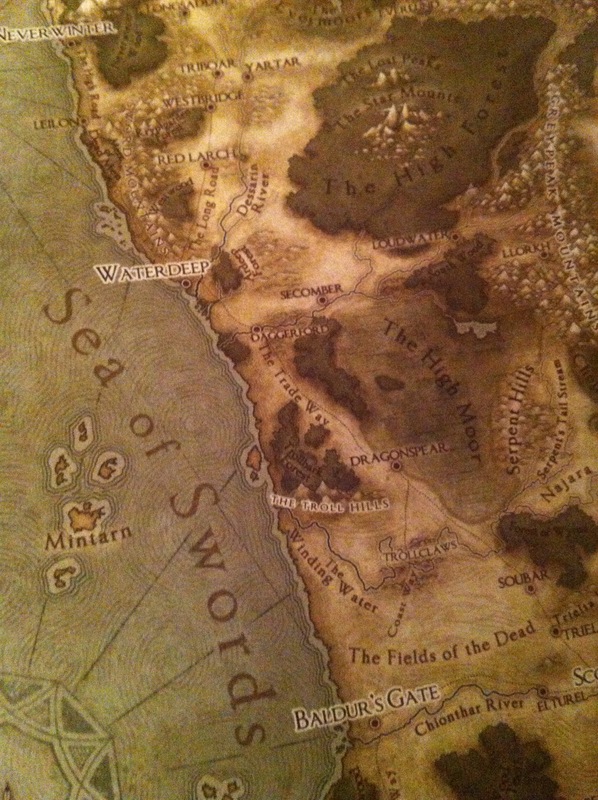 Set in Forgotten Realms, on the Sword Coast, so familiar territory to many. It’s hardback, which seems unnecessary, and it’s got hefty rough paper that you could scrawl in the margins of if you were of a mind. It’s a good looking beast, with art that has more action and clarity than the washier PHB stuff. The maps are by Jared Blando and they are quite divine (his stuff was used towards the end of the 4e run, and they really brought some locations to life.) A quick flick through makes this look like good reading, with superb production values. At £20 it’s at the higher end of adventure pricing. Mike Mearls writes a warm foreword and points put that this book only needs Basic (available for free online) and the free online appendix to run the campaign. That appendix is the monsters and items that are not unique to this book. Interesting, and a move I’m all for, in principle. If I’m going to get more space devoted to the ideas, and can print and manipulate the crunch, then that makes this better value than it’s thickness would otherwise suggest. Though I know that will be seen as a bug for others. Instead of the usual ‘hooks’ that you find in many adventures, here you get a similar idea, but wedded to the 5e Backgrounds rule. Characters can add to, or replace their usual Bond and Feature with one specific to this adventure. There are ten alternate Bonds and two features. They go from so-so to super cool, and include the occasional secret. Nice touch. Part one involves a village coming under attack for a force of the Cult of the Dragon who are looking for loot to stoke the hoard they need to get Tiamat’s interest. The town is presented as almost on a siege footing, with the parties job being to get townsfolk to the safety of the keep. Once done, there are a selection of commando missions for them to perform to see the night out. All of these are interesting, and are rarely pitched battle encounters with equal forces. Tactics and strategy of behalf of the players will be necessary. There’s even a dragon assault, and at level 1 the party is toast if they go for straight confrontation. I like this section for its narrative potential, and can see some really dramatic scenes playing out involving fire, darkness and terror against the backdrop of an invading force. On the downside, there are errors, and some of them seem quite basic. The map of the village is next to useless. It’s keyed numerically, though the text doesn’t reference it. One mission is set outside the bounds of the map. There’s an apparently important commander that gets named, and is statted in the appendix, but there’s no other text to support her appearance. Did I miss it, or who is Frulam Mondrath? There are also apparently such things as half-dragons. Are these Dragonborn? I don’t know. If not, what’s the difference? Lastly, the milestone method of gaining XP makes this section enough to get to second level. But, if you want to go traditional on your XP, tot up even a couple of the potential combats (and there are many) and you’ll see you’re getting short changed. 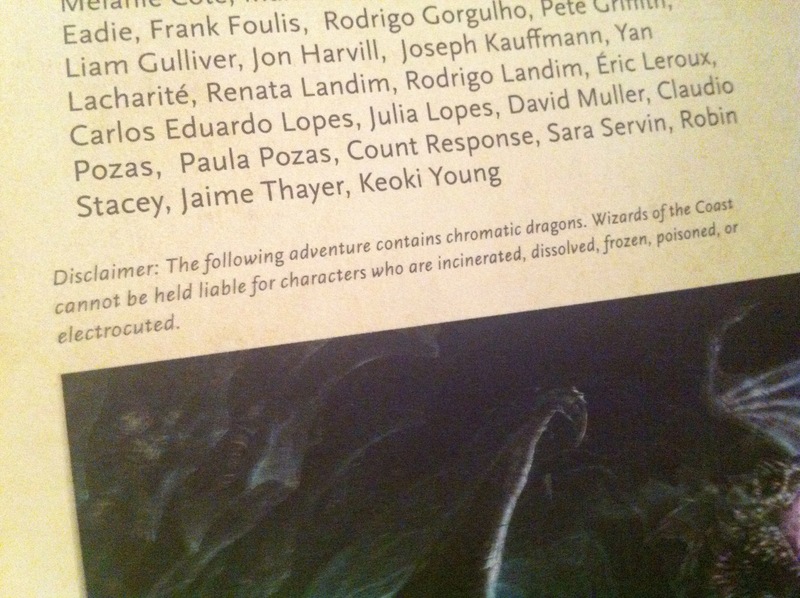 My guess is that this was down to the adventure and the encounter rules all being in development at the same time. To see the pacing off in the first game makes me nervous. In the ‘irritating but not fatal’ camp, the online appendix is a must have as encounters use plenty of creatures from there, but they’re mixed in with ones in the back of this adventure. The online appendix doesn’t include the ones from this book, so you’ll need to bookmark physically, and refer to a third document. That’s unwieldy. And then the thing that as a 4e DM is going to drive me nuts: NPC spell casters have the spells listed in their blocks, but not the effects, not even short hand. I’ll get to know these things off the top of my head eventually, but this is a real throwback from 4e’s innovation to put everything at the DMs fingertips. Speaking of NPCs, they get very little in the way of characterisation, hardly even a physical description. The episode is 7 pages of double columned text, and reasonably dense, but it could have done with better formatting and use of space. The NPCs needed a portrait and a few lines in a side bar really. All in all, the first episode reads ok, and I think it will deliver a good session or two. However, it’s an inefficient read, that leaves me as a DM with some book keeping to do, and some extra prep in store. I don’t spend money on adventures to do that. I playtested this back along and it did play really well. We loved it but as you say. However being worked on in conjunction with the changing goalposts, that was the rules in development, didn’t help. So kudos to the guys for getting it this good, despite that. On a practical note, the book flipping for stats and spells is a little wearing. But I guess for the time being you grin and bear it until, the new Dungeonscape app can help with. Anyway fair review mate, look forward to hearing what you have to say about the rest of the book. Hey Baz meant to mention this, if you want to make it easier to DM bad guys with spells this site http://5espellbook.azurewebsites.net/ has a list of new 5e spells which you can get made into simplified cards, to print out and use. I can imagine hacking these to cut and past the info into a stat block to use. Not ideal, but its a potential work around. Thanks for that link, looks really handy! This is exactly how I felt after reading it. Coming from using paizo’s products I feel that this really has to improve, the concept is good, but muddled. There is no reason they couldn’t update the digital appendix with everything IMO, and it should be bookmarked fully. The mines of phandelver while also having issues, I feel was better laid out and struck a good balance that allowed for more flexibility imo. And that’s literally all we are told about her, and not upfront. Her first mention is p9, where she is glimpsed from afar. We can only infer that she’s important. We get no more than a name and the fact she wears purple. In the same encounter we might learn of another leader call Rezmir, who also gets an occasional mention. 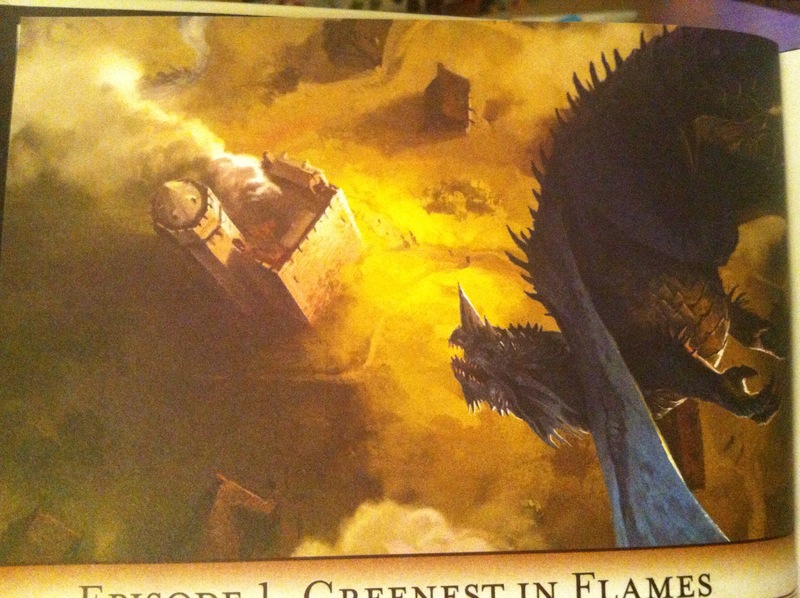 Frulam gets a picture in the next chapter (p15) and the party might meet her in that episode, as prisoners. She asks all the questions. Finally, salted away in one of the possible pieces of info the party can gather we learn that Frulam “handles everyday operations”. Lastly,mashes is encountered as a foe in episode 3. Her stats get used. She dies. Not enough, and what there is is spread around and hard to glean.